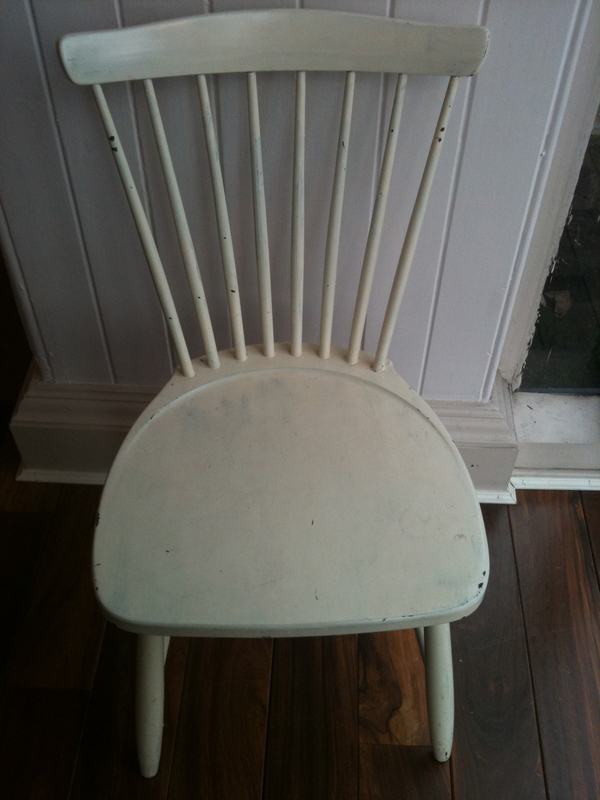 I have spent the last week sanding and gluing a new project – I kept two chairs from the Christmas dinner table – the table that was kept in the good room and only sat around for celebrations. Goodness knows why but – hey it was part of my life. 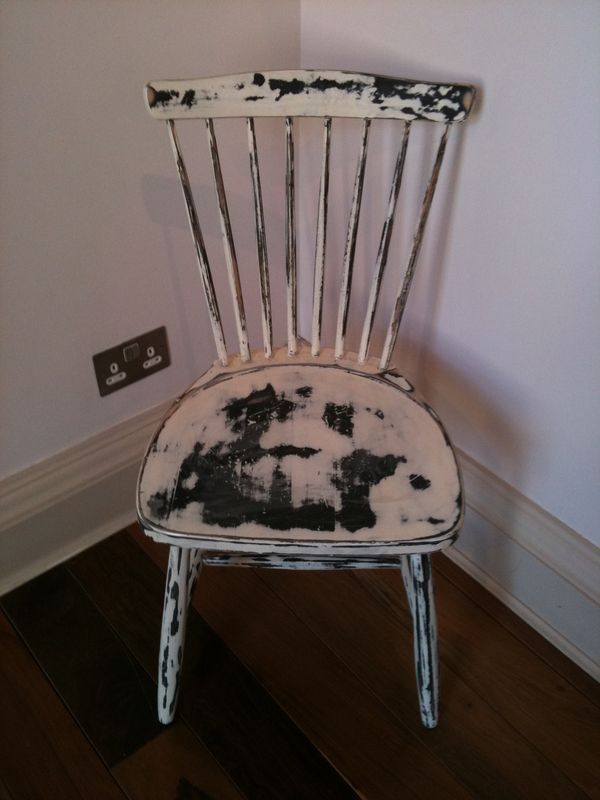 I kept the large chair with the arms that was always dads chair and the other was one of 5 identical chairs that I had painted with cream gloss for some reason or other. The earliest discovery of a chair created in Ancient Egypt dates back to 2680 BC while the most famous discovery of a chair was in 1352 when the throne of Pharaoh Tutankhamen was discovered within a tomb. Furniture of Ancient Egypt, including chairs, were designed for both functionality as well as a form of art. I wanted my chairs to serve as both. The seat is the most important piece of furniture in Africa, usually taking the form of a stool or a chair. It serves as a social insignia because every person is entitled to a type of seat that corresponds to their social rank. It was said that a man was judged and respected according to the kind of stool he had. Stools can be bought by anyone, as long as the model is appropriate to the person’s social status. The stool was understood to be the seat of its owner’s soul. When not in use it was therefore placed at a slant against a wall so that none of the souls passing by could settle on it. The Asanti say that there are no secrets between a man and his stool. The golden stool is very carefully protected. No one has ever sat on it and since its arrival, IT HAS NOT TOUCHED THE GROUND. As an Ashanti symbol, the golden stool represents the worship of ancestors, well-being, and the nation of Ashanti. It is always lying on its own stool or on the skin of an animal. One and Three Chairs, 1965, is a work by Joseph Kosuth. 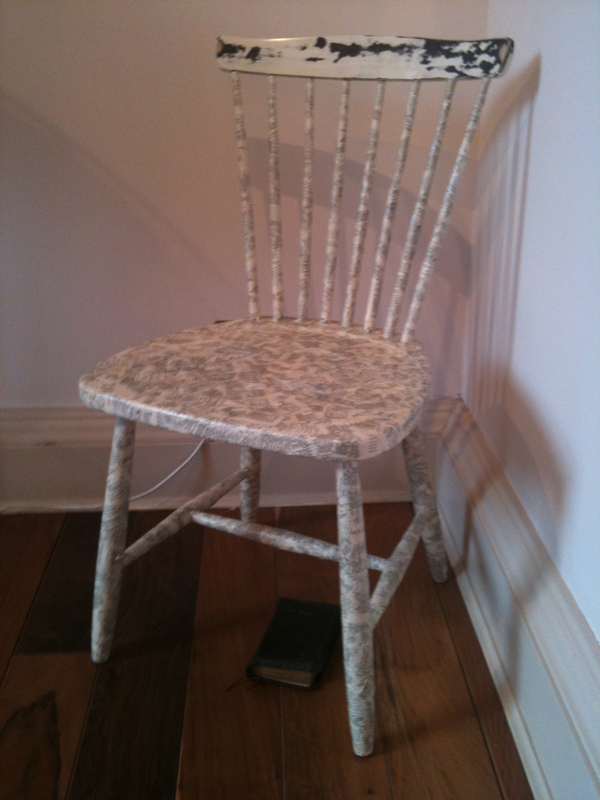 The piece consists of a chair, a photograph of this chair, and an enlarged dictionary definition of the word “chair”. The photograph depicts the chair as it is actually installed in the room, and thus the work changes each time it is installed in a new venue. Two elements of the work remain constant: a copy of a dictionary definition of the word “chair” and a diagram with instructions for installation. Both bear Kosuth’s signature. 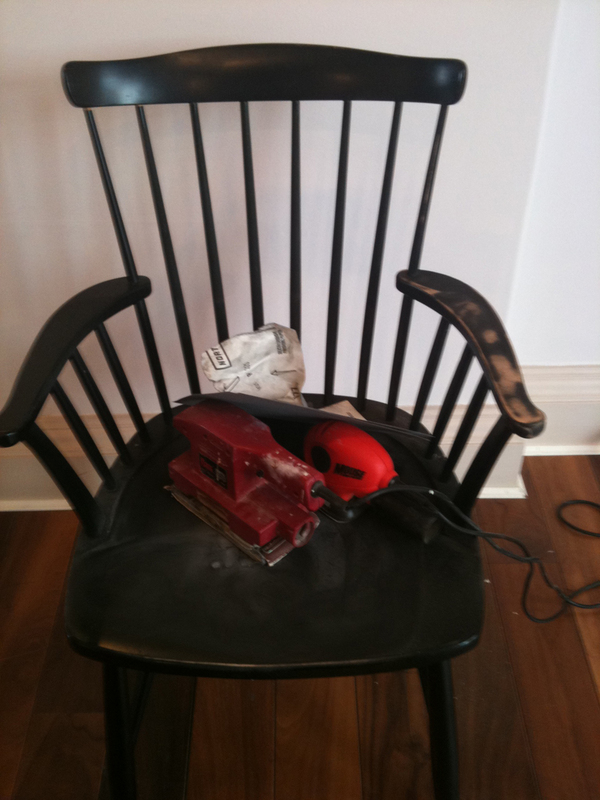 Under the instructions, the installer is to choose a chair, place it before a wall, and take a photograph of the chair. This photo is to be enlarged to the size of the actual chair and placed on the wall to the left of the chair. Finally, a blow-up of the copy of the dictionary definition is to be hung to the right of the chair, its upper edge aligned with that of the photograph. The first part of my installation is celebrate the spiritual relevance of the chair, the ceremonies it was part of and the importance it was given in the room it was never allowed to leave. Apparently, ever since I was little I have been practicing ‘decoupage’- I just thought it was a nice way to use one thing (books or maps) to make another (video cabinets, chairs, boxes) nice! I covered the entire chair with my mothers bible – I had kept a little bible when I moved house but had no intention of reading it although I would not have charity shopped it. 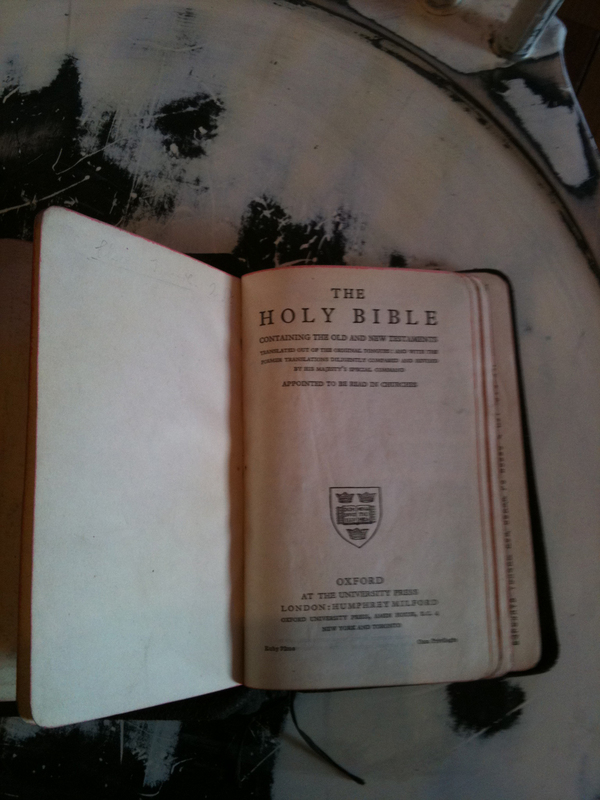 I have no idea what happened to the other bibles we had at home, these belonged to my fathers side of the family. 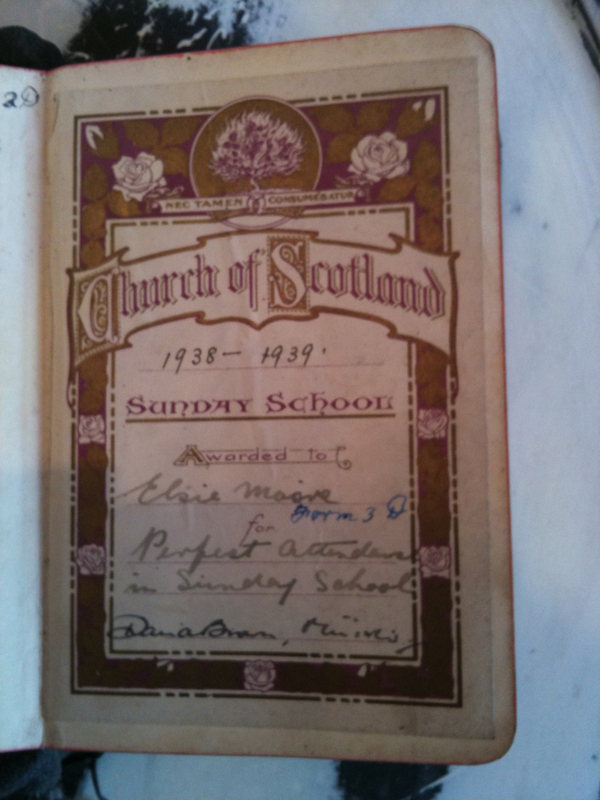 The little bible had a book plate inside inscribed to my mother for perfect attendance at Sunday school. We were not a religious family, my parents attended church occasionally – never during my life. I went to Sunday school and church at Easter with the school. 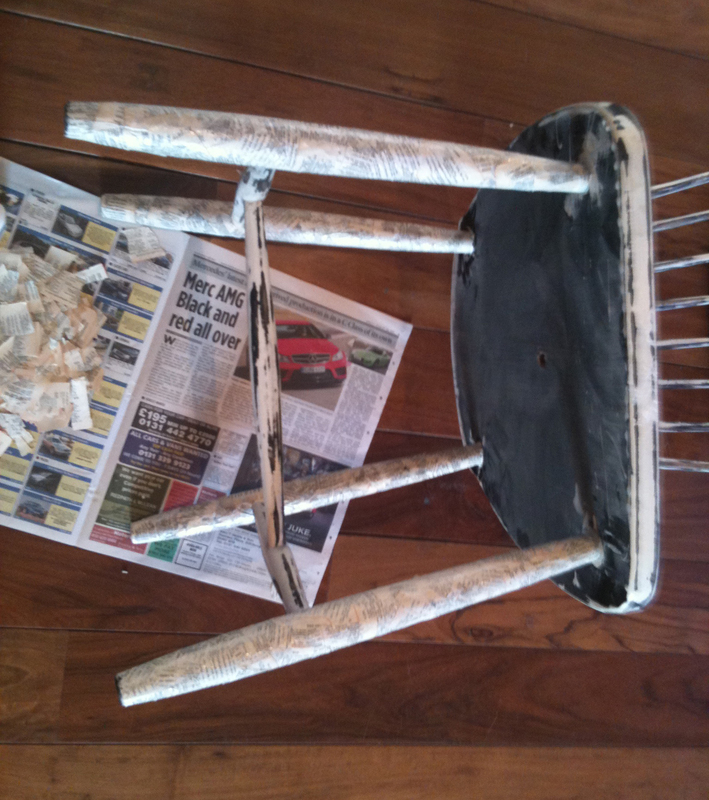 Step 2 – Dads chair …..